Visualizations (aka visuals) display insights that have been discovered in the data. A Power BI report might have a single page with one visual or it might have pages full of visuals. In Power BI service, visuals can be pinned from reports to dashboards. It's important to make the distinction between report creators and report consumers If you are the person building or modifying the report, then you are a creator. Creators have edit permissions to the report and its underlying dataset. In Power BI Desktop, this means you can open the dataset in Data view and create visuals in Report view. In Power BI service, this means you can open the dataset or report in the report editor in Editing view. If a report or dashboard has been shared with you , you are a report consumer. You'll be able to view and interact with the report and its visuals but you won't be able to save changes. 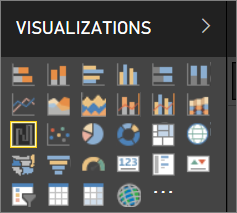 There are many different visual types available directly from the Power BI VISUALIZATIONS pane. And for even more choices, visit the Microsoft AppSource community site to find and download custom visuals provided by Microsoft and the community. If you're new to Power BI, or need a refresher, use the links below to learn the basics of Power BI visualizations. Alternately, use our Table of Contents (along the left side of this article) to find even more helpful information. Create visualizations on the pages of your reports. Browse the list of available visualizations and available visualization tutorials. Add a custom visualization that you created yourself or that you found in the Microsoft AppSource community site. Feeling creative? Dig into our source code and use our developer tools to create a new visualization type and share it with the community. To learn more about developing a custom visual, visit Developing a Power BI custom visual. Try changing the type of visualization to see which works best with your data. In Power BI service, when you have the visualization the way you want it, you can pin it to a dashboard as a tile. If you change the visualization being used in the report after you pin it, the tile on the dashboard doesn't change -- if it was a line chart, it stays a line chart, even if you changed it to a Doughnut chart in the report.